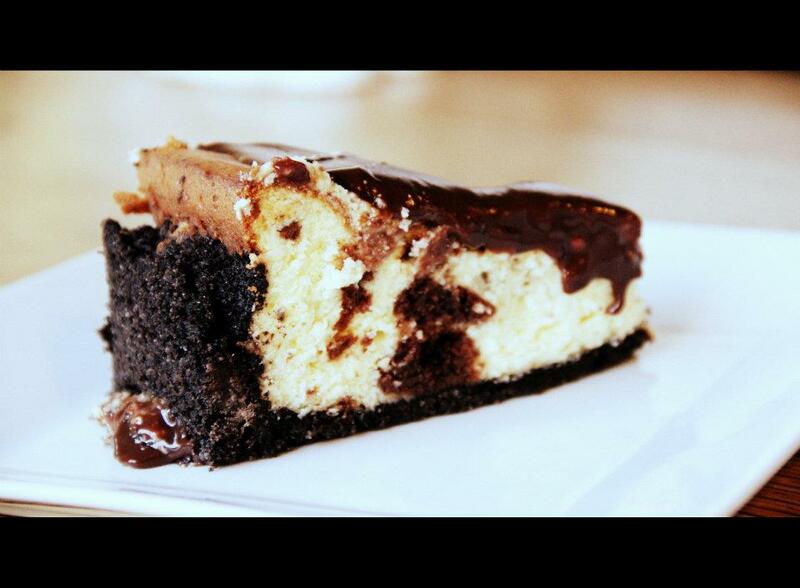 brownie mosaic cheesecake. you need some. Each time I make dessert for a family holiday, it typically ends up being something that is a smidge on the indulgent side. Family simply has a way of making me feel “at home” and comfortable. Whomever those people are in your life that you consider to be your family, they are the components of your life that keep it all together; they weave your fabric. It only makes sense that these are the people you can truly be yourself around. At times when I feel like I can truly be myself, I’m usually eating something Jenny Craig wouldn’t love so much. I came across this recipe and just knew that there was nothing more I wanted than to finish up a relaxing dinner with family, grab dessert spoons and dive right in. This is one of those cakes that you set out on the table immediately, prior to dinner being served, as a reminder that there is a dessert that will follow the main course which requires room to be spared. 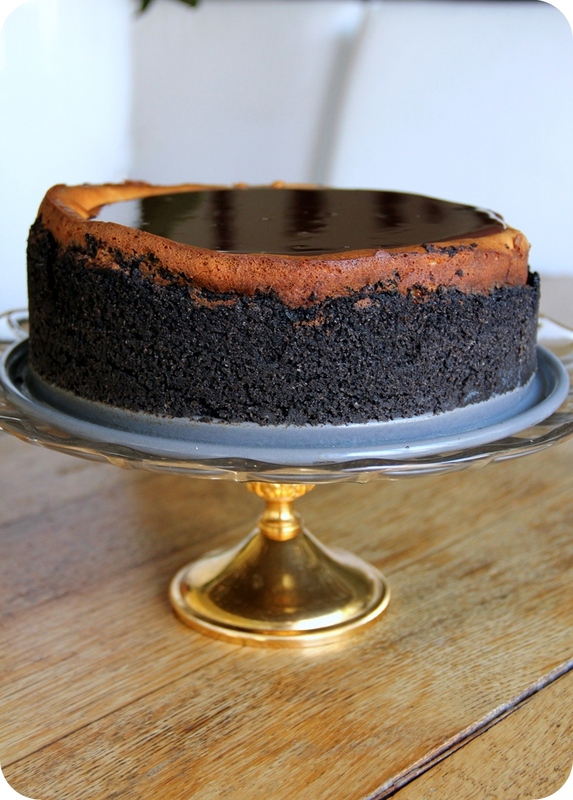 A smooth cheesecake with chunks of brownie throughout like little buried treasures, held together with a crushed crunchy-cookie crust and topped with a velvety puddle of c.h.o.c.o.l.a.t.e. ganache on top, make this treat one that will have you seriously loving life. It is not only gorgeous to look at, but will live up to everything your heart and soul require. 1. To make the Brownies: Preheat oven to 350°F. Line 13×9-inch baking pan with foil, with ends of foil extending over sides of pan. Grease foil. 2. Microwave chocolate and butter in large microwaveable bowl on HIGH 2 min. or until butter is melted. Stir until chocolate is completely melted. Stir in sugar. Blend in eggs and vanilla. Add flour and salt; mix well. Spread into prepared pan. 3. Bake 30 to 35 minute or until toothpick inserted in center comes out with fudgy crumbs. (Do not overbake.) Cool in pan on wire rack. Remove brownies from pan, using foil handles. 4. Cool brownies, then cut them into 3/4- to 1-inch squares for use in the cheesecake (I used a pizza cutter, per Deb’s recommendation). You will have more than the two cups of cubes, loosely measured, than you will need, and I’m sorry, you’re just going to have to decide for yourself what to do with the extra. Add cubes to cake batter as directed below. 5. To make the Crumb Crust: Stir together the Crumb Crust ingredients and press into bottom and 1 inch up side of a buttered 10″ springform pan. Fill right away or chill for up to 2 hours. 6. To make the Cheesecake: Preheat oven to 350°F. 7. Beat together cream cheese and sugar with an electric mixer until fluffy. Add eggs, 1 at a time, then vanilla, beating on low speed until each ingredient is incorporated and scraping down bowl between additions. 8. Fold brownie cubes in very gently and pour mixture into prepared pan. Put springform pan with crust in a shallow baking pan. Pour filling into crust and bake in baking pan (to catch drips) in middle of oven 45 minutes, or until cake is set 3 inches from edge but center is still slightly wobbly when pan is gently shaken. 9. When completely cool, top with following glaze. 10. To make the Ganache Glaze: Place finely chopped chocolate in a medium size mixing bowl. Scald the butter and cream together in a saucepan (or in the microwave on HIGH for 1 minute). Pour the cream mixture over the chocolate and stir until the chocolate is completely melted. Whisk in vanilla and then whisk in powdered sugar until smooth. Spread over cheesecake while ganache is still warm. Chill until ready to serve.